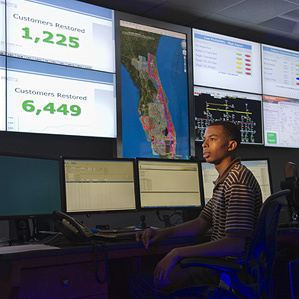 Smart power: Andrew Brown, an engineer at Florida Power & Light, monitors equipment in one of the utility’s smart grid diagnostic centers. May 2, 2013 – Conventional power grids can’t handle big storms or large-scale renewable energy. The first comprehensive and large scale smart grid is now operating. The $800 million project, built in Florida, has made power outages shorter and less frequent, and helped some customers save money, according to the utility that operates it. Smart grids should be far more resilient than conventional grids, which is important for surviving storms, and make it easier to install more intermittent sources of energy like solar power (see “China Tests a Small Smart Electric Grid” and “On the Smart Grid, a Watt Saved Is a Watt Earned”). The Recovery Act of 2009 gave a vital boost to the development of smart grid technology, and the Florida grid was built with $200 million from the U.S. Department of Energy made available through the Recovery Act. Dozens of utilities are building smart grids—or at least installing some smart grid components, but no one had put together all of the pieces at a large scale. Florida Power & Light’s project incorporates a wide variety of devices for monitoring and controlling every aspect of the grid, not just, say, smart meters in people’s homes. “What is different is the breadth of what FPL’s done,” says Eric Dresselhuys, executive vice president of global development at Silver Spring Networks, a company that’s setting up smart grids around the world, and installed the network infrastructure for Florida Power & Light (see “Headed into an IPO, Smart Grid Company Struggles for Profit”). In FPL’s system, devices at all of these places are networked—data jumps from device to device until it reaches a router that sends it back to the utility—and that makes it possible to sense problems before they cause an outage, and to limit the extent and duration of outages that still occur (see “The Challenges of Big Data on the Smart Grid”). The project involved 4.5 million smart meters and over 10,000 other devices on the grid. The project was completed just last week, so data about the impact of the whole system isn’t available yet. But parts of the smart grid have been operating for a year or more, and there are examples of improved operation. Customers can track their energy usage by the hour using a website that organizes data from smart meters. This helped one customer identify a problem with his air conditioner, says Bryan Olnick, vice president of smart grid solutions at Florida Power & Light, when he saw a jump in electricity consumption compared to the previous year in similar weather. The meters have also cut the duration of power outages. Often power outages are caused by problems within a home, like a tripped circuit breaker. Instead of dispatching a crew to investigate, which could take hours, it is possible to resolve the issue remotely. That happened 42,000 times last year, reducing the duration of outages by about two hours in each case, Olnick says. The utility also installed sensors that can continually monitor gases produced by transformers to “determine whether the transformer is healthy, is becoming sick, or is about to experience an outage,” says Mark Hura, global smart grid commercial leader at GE, which makes the sensor. Ordinarily, utilities only check large transformers once every six months or less, he says. The process involves taking an oil sample and sending it to the lab. In one case this year, the new sensor system identified an ailing transformer in time to prevent a power outage that could have affected 45,000 people. Similar devices allowed the utility to identify 400 ailing neighborhood-level transformers before they failed. Smart grid technology is having an impact elsewhere. After Hurricane Sandy, sensors helped utility workers in some areas restore power faster than in others. One problem smart grids address is nested power outages—when smaller problems are masked by an outage that hits a large area. In a conventional system, after utility workers fix the larger problem, it can take hours for them to realize that a downed line has cut off power to a small area. With the smart grid, utility workers can ping sensors at smart meters or power lines before they leave an area, identifying these smaller outages. And smart grid devices are helping utilities identify problems that could otherwise go misdiagnosed for years. In Chicago, for example, new voltage monitors indicated that a neighborhood was getting the wrong voltage, a problem that could wear out appliances. The fix took a few minutes. As more renewable energy is installed, the smart grid will make it easier for utilities to keep the lights on. Without local sensors, it’s difficult for them to know how much power is coming from solar panels—or how much backup they need to have available in case clouds roll in and that power drops. But whether the nearly $1 billion investment in smart grid infrastructure will pay for itself remains to be seen. The DOE is preparing reports on the impact of the technology to be published this year and next. Smart grid technology is also raising questions about security, since the networks could offer hackers new targets (see “Hacking the Smart Grid”).